DataSolutions, the specialist IT distributor, will host its sixth annual Secure Computing Forum in the Aviva Stadium in Dublin on Thursday, 20th September 2018. Pictured at the announcment are (L - R): Susan Cahalane, account manager, Check Point Software Technnologies, Ltd; Michael O'Hara, group managing director, DataSolutions; and David Keating, group security sales director, DataSolutions. DataSolutions, the specialist IT distributor, today announces that it has had its best ever year, growing group revenues by 34% to €40 million for year-end 31st March 2018. The company has doubled its business in the past three years and is on-track to grow to €80 million by 2021. DataSolutions expanded its operations to the UK at the beginning of 2016, investing over €5 million in the expansion, taking on new employees and strengthening its partnerships in the market. The UK market now accounts for 30% of DataSolutions business and the company expects this to grow to 50% in the next three years. The company is developing an expansion fund to continue the growth in both the Irish and UK markets. Part of this expansion fund will be ear-marked for acquisitions as DataSolutions seeks to acquire complementary businesses in the UK and Ireland. 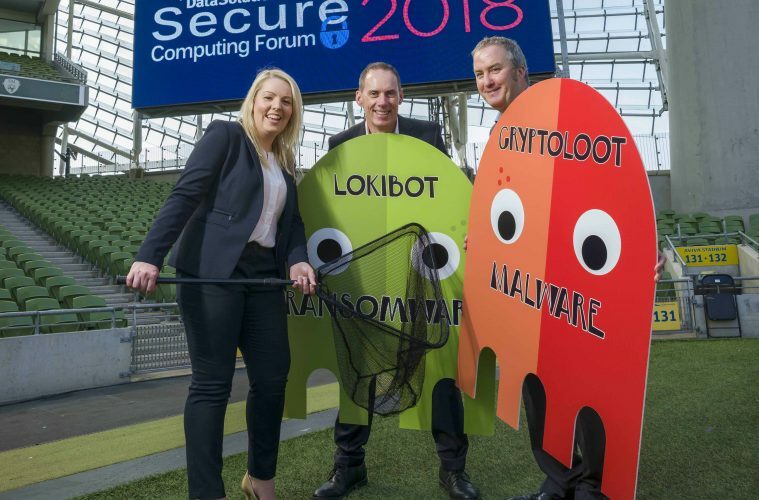 For businesses wanting to learn more about the latest cyber security trends, DataSolutions will host its sixth annual Secure Computing Forum in the Aviva Stadium in Dublin on Thursday, 20th September 2018. As one of Ireland’s largest cybersecurity events more than 400 IT and business professionals are expected to attend. This year’s forum will focus on putting cybersecurity at the heart of business strategy and look at the ongoing threat posed by ransomware. For more information visit https://www.securecomputingforum.ie and Irish Tech News will be featuring some of the speakers on our podcast over the next 3 or 4 weeks.